A machine that would allow scientists to peer deeper than ever before into the atomic nucleus is a big step closer to being built. A high-level panel of nuclear physicists is expected to endorse the proposed Electron-Ion Collider (EIC) in a report scheduled for publication by October. It is unclear how long construction would take. The panel is the [DOE] Nuclear Science Advisory Committee, or NSAC, which produces regular ten-year plans for the US Department of Energy (DOE) and the National Science Foundation. Its latest plan is still being finalized, but NSAC’s long-range planning group “strongly recommended” construction of the EIC at a meeting last month, says NSAC member Abhay Deshpande, a nuclear physicist at Stony Brook University in New York. The EIC will almost certainly be formally endorsed in the NSAC report, he says. It must then be approved by the DOE, but most projects backed by the expert panel have come to fruition, he says. The collider would allow unprecedented insights into how protons and neutrons are built up from quarks and the particles that act between them, known as gluons. The current leading facilities for studying quark–gluon matter are the Relativistic Heavy Ion Collider (RHIC) at Brookhaven National Laboratory in Upton, New York, and the Large Hadron Collider at CERN, Europe’s particle-physics laboratory near Geneva, Switzerland. These facilities smash protons and heavy ions together to recreate the energetic conditions of the early Universe, when quarks and gluons existed as a plasma rather than in atomic nuclei. The EIC would collide point-like electrons with either protons or heavy ions, generating collisions that have a similarly high energy but are more precise and so can be used to study subatomic particles in detail. In particular, the EIC would be ideal for studying an exotic state of matter that is made up entirely of gluons. The machine should also solve a puzzle about the proton that has baffled physicists for nearly 30 years. The proton has a quantum-mechanical property called spin, but, strangely, the spins of its three constituent quarks add up to only about one-third of its own spin. The EIC would determine what makes up the difference: options include the spin of the proton’s gluons, the angular momentum of its quarks or of the gluons from their orbital motion, or a mixture of all three. “Until we have the EIC, there are huge areas of nuclear physics that we are not going to make progress in,” says Donald Geesaman, a nuclear physicist at Argonne National Laboratory in Illinois, and the chair of NSAC. The machine would not be built from scratch. One option is to add an electron-beam facility to RHIC — a plan that is estimated to cost about US$1 billion and would depend on some as-yet-unproven technologies. 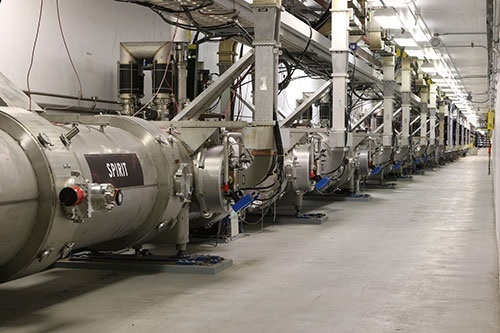 Another is to add an ion accelerator and new collider rings to the Continuous Electron Beam Accelerator Facility [CEBAF] at the Thomas Jefferson National Accelerator Facility in Newport News, Virginia, which would cost about $1.5 billion. Deshpande hopes that the DOE will give the collider the thumbs up within a year of the NSAC plan’s publication. Two or three more years would be needed to finalize the competing bids and choose one, meaning that construction could start in about 2020 and be completed five years later, he says. Others say that this outlook is too rosy. The 2008 financial crisis led to a drop in science funding that forced NSAC to review its 2007 ten-year plan. A specially formed subcommittee concluded in 2013 that RHIC would have to shut down if funding for the DOE’s Office of Nuclear Physics remained flat over the following five years. In fact, those funds have grown slightly, keeping RHIC in business, but the scare led to a more cautious approach this time around, says Geesaman. He points out that when the DOE and the National Science Foundation commissioned the ten-year plan, they specified that NSAC should consider what US physicists could achieve if funding remained flat, as well as how much support they would need to maintain a “world-leadership position”. Robert McKeown, deputy director for science at the Jefferson lab, thinks that limited funds might delay the start up of the EIC until at least 2030. And Michael Lubell, director of public affairs at the American Physical Society, questions whether it is feasible for the EIC to be built by the United States alone. He notes that the $1.5-billion Long-Baseline Neutrino Experiment became an international project [DUNE managed by FNAL] after a slimmed-down $600-million version failed to pass scientific muster. “It is hard to see how to do this unless you get international buy-in,” he says. Deshpande thinks that the United States can go it alone. But he notes that collaborations at CERN and in China are also developing plans for electron–ion colliders and that the three groups are already exchanging ideas.